Even though Friends came to an end a loooong time ago, it still remains a staple in our lives and a great show to fall back on when you're looking for a good binge. Sadly, the illusion that the gang was as warm and welcoming in real life as they were on the show might be just that — an illusion. Honesetly, I would be shook if you found me a person on this earth who has a Netflix account but has never once seen Friends. It's one of the few shows out there that 99% of the people have collectively watched at least one or two episodes of (that is if they haven't watched the entire series two dozen times). If you're like me and couldn't be bothered to skip the show's intro, and instead sat through the entire thing (and maybe even clapped along), then "I'll Be There For You" is likely forever ingrained in your memory. Everything, from the warm and fuzzy theme song to the way that the six main cast members seem to get along on-screen, led us to believe that the group would be a welcoming bunch in real life. I mean, most of us grew up watching this group of friends grow up together. So basically, what I'm saying is that I feel like I'm their friend too, okay? Anyway..
You can imagine my shock and disappointment when I recently learned that the group wasn't as welcoming as I initially thought they were. 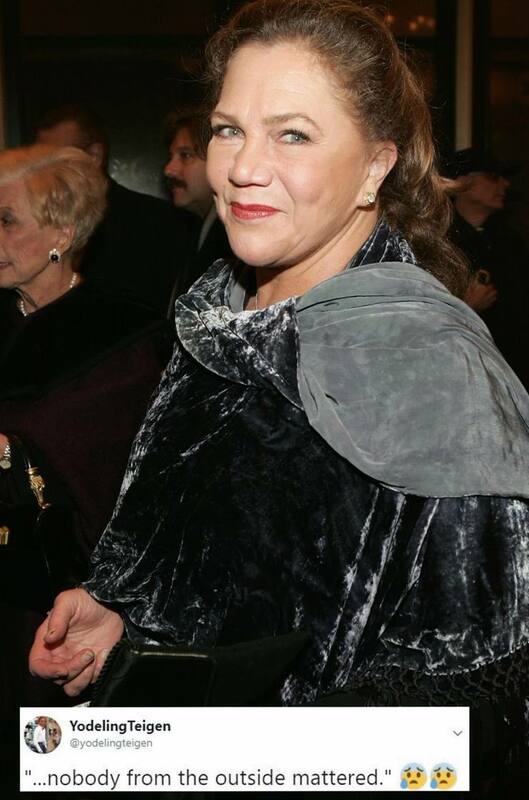 Kathleen Turner was a semi-frequent guest star on the show. She appeared in three episodes where she played Chandler's dad, Charles Bing, a professional drag queen who went by the name of Helena Handbasket. She recently opened up in an interview with Vulture about her experience on the show and how it was to play that character. When asked about what stands out about her experience on Friends, she revealed that she didn't feel very welcomed by the cast. "I remember I was wearing this difficult sequined gown — and my high heels were absolutely killing me," she explained. "I found it odd that none of the actors thought to offer me a seat. Finally, it was one of the older crew members that said, 'Get Miss Turner a chair,'" she added. She went on to refer to the Friends actors as a "clique," and she didn't think that her experience on the set was unique. "I think it was simply that they were such a tight little group that nobody from the outside mattered," she explained. When asked about how she found them as actors and actresses, she refused to comment on that. Kathleen has been acting since the '80s, so she would be more than qualified to speak on their skills, but she says that she felt that because she worked with them for such a short period of time, it wasn't fair to do. "I do respect the camaraderie they had. You can see camaraderie on the screen," she added. And there you have it: All my very realistic hopes and dreams of becoming buddies with the Friends cast are now shattered into pieces. I'm really bummed out, you guys.